Corporal punishment in black culture: What Charles Barkley doesn’t understand about the Adrian Peterson child abuse case. What Charles Barkley gets wrong about corporal punishment and black culture. 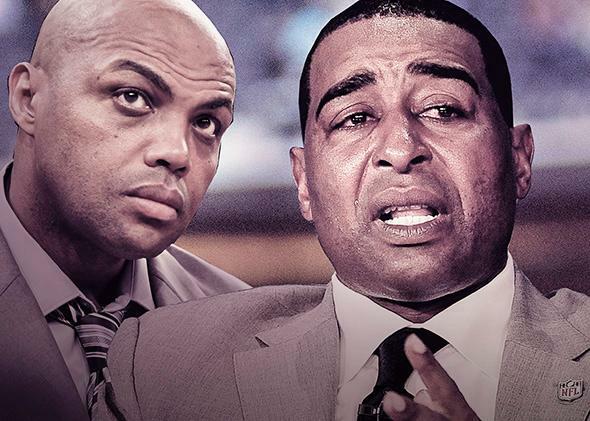 What Charles Barkley, left, gets wrong, Cris Carter gets right. Photo illustration by Slate. Photos by Bruce Bennett/Getty Images Sport, Stacy Revere/Getty Images. Barkley’s was the loudest voice in a chorus of those who came forward to support Peterson. But the problem is that Barkley and the rest of the NFL star’s supporters have offered exposition without explanation—they are describing something that happens without addressing why it happens, let alone making a convincing case for why it should continue. Barkley’s circular logic comes down to: It’s OK to hit your child in the name of discipline because many parents hit their children in the name of discipline. Such thinking is not only illogical—it’s also dangerous. Why, then, does corporal punishment have such staying power? One possible explanation may lie in a string of studies that suggest the negative psychological impacts on the child are actually less pronounced in communities where corporal punishment is more common. Put another way, a kid is less likely to feel ashamed and singled out if all the other children in his neighborhood are getting spanked too. That may sound counterintuitive at first, but the explanation likely lies in the reasons that corporal punishment tends to cause psychological problems in the first place. In short, the context of the punishment can matter as much if not more than the punishment itself. (It’s worth noting here, as Slate parenting columnist Melinda Wenner Moyer has previously, that there is room for some nuance in the debate: Whipping a child with a switch will likely result in a far worse psychological outcome than a light spanking delivered over the clothes with an open hand.) Some researchers believe that if a kid sees his spanking as unusual—a “non-normative experience,” in psychological parlance—he may be more likely to interpret it as a sign of parental rejection, which in turn fuels his anxiety and aggressiveness, the most common psychological problems associated with corporal punishment. So, does the fact that spanking is more common in black communities mean that black children won’t suffer adverse consequences from corporal punishment? Jennifer E. Lansford, an associate research professor at the Social Science Research Institute at Duke’s Sanford School of Public Policy, cautions not to go that far. “The effects may not be as pronounced for children in black communities, but let me be clear: The negative effects are still there,” she says. If the consequences are less pronounced in a particular community, though, then it stands to reason that the community will be less likely to view physical punishment as a problem. And so the cycle fuels itself: The more a community embraces spanking, the more children are spanked, the less social stigma there is attached to the act, the less children feel ashamed and preyed upon, the less likely the community sees it as a problem that needs to be addressed, the more parents embrace spanking. That cycle is only exacerbated by how Barkley and his fellow Peterson supporters are talking about corporal punishment. One recent study of more than 100 children and their parents, for example, found that every parent who approved of spanking a child for hitting a sibling passed that belief on to his kids. Few of us want to admit that our parents were doing something wrong when they were, quite likely, doing what they thought was best. And so we refuse to consider that we turned out all right in spite of the spankings, not because of them. Perhaps the best example of how we should be talking about corporal punishment came from a different NFL pregame show. On ESPN’s Sunday NFL Countdown, Cris Carter—who, like Peterson, played for the Vikings—delivered an emotional speech that proved it was possible to avoid blaming our parents while still promising not to make the same mistakes they did. To put an end to corporal punishment, we need more Cris Carters and fewer Charles Barkleys. The only way to stop this vicious cycle is to understand that just because everyone is doing it, that doesn’t mean it’s right.